The suggested portion is 25g. Store in a dry, cool place. Mix the product before use. After opening, it is best to consume within 3 months. 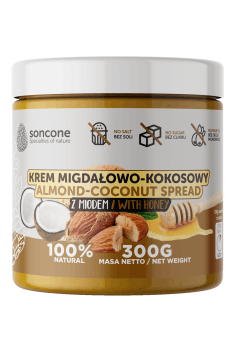 Almond-coconut cream with honey is a great solution for adding nutritional value to your diet without increasing greatly the size of meals. A small amount is rich in healthy fat and protein. As a result, it will work wonders for individuals whose low appetite makes it difficult to consume enough calories. It will be beneficial to persons following vegetable diets because it has a higher protein content even than meat products. The best way of using this product is to spread it on bread, omelettes, pancakes or waffles. However, many people like eating the cream straight out of the jar with a spoon. A daily amount should be adjusted to your energy expenditure. Lyophilised Saccharomyces boulardii yeast cultures in the patented form BIOOTIC™.